It is vital to have knowledge of the neuroanatomical structures and functional neurological mechanisms, which are disrupted in neurogenic speech/language, disordered persons in order to understand the speech/language deficits themselves. This book provides a comprehensive coverage of the neurological basis of both the clinically recognised forms of aphasia and the various motor speech disorders, in both children and adults. It also covers more recently recognised language disorders, such as Parkinsons and related diseases, right hemisphere damage, closed-head injury, dementia, etc. 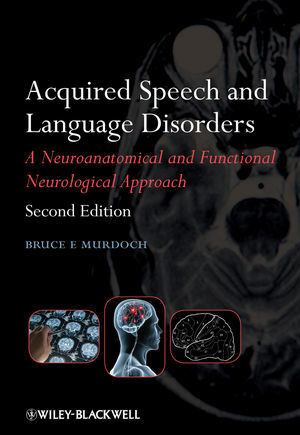 This is a perfect text for practitioners who need to understand the integration of neuroanatomy and functional neurology with the practice of speech-language pathology. Professor Bruce E. Murdoch is the Director of the Centre for Neurogenic Communication Disorders Research and Head of the School of Health and Rehabilitation Sciences at the University of Queensland, Brisbane, Australia. He is the founding editor of the Asia Pacific Journal of Speech, Language and Hearing, the Foundation President of the Asia Pacific Society for the Study of Speech, Language and Hearing; and Vice-President of the International Association of Logopedics and Phoniatrics.